Kenya Woodruff is a partner in the firm's Health Care practice. Her practice is dedicated to health care regulatory counsel and the design and execution of related merger, acquisition and joint venture strategic partnerships. Kenya focuses on the creation and maintenance of compliant health care operations and structures for physicians, hospitals, home health and hospice providers, accountable care organizations and clinically integrated networks. Her practice also includes advice on compliance with Health Insurance Portability and Accountability Act (HIPAA), the Health Information Technology for Economic and Clinical Health Act (HITECH Act), Stark Law, Anti-Kickback Statutes and other applicable fraud and abuse laws. 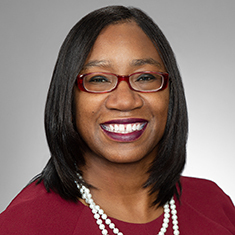 Kenya served as deputy general counsel at the Dallas County Hospital District d/b/a Parkland Health & Hospital System where she was the lawyer primarily responsible for government investigations and provided legal support and consult for the hospital's daily operations. Her experience also includes being the vice president of compliance and associate general counsel for a national radiology services company. Shown below is a selection of Kenya’s engagements. Representation of a national hospital system in the acquisition of a hospital system in San Antonio, Texas, including necessary licensure change of ownership applications. Representation of a Texas entity in the formation and implementation of chiropractic practice management entities in Ohio, Illinois and Washington. Representation of an accountable care organization with more than 350 independent physicians and an investor entity in the formation, application process and operation phases. Representation of a group of physicians in the formation of a tax-exempt 501(c)(6) physician alliance designed to encourage best clinical practices and to improve the quality of care for patients in North Texas. Representation of a psychiatric hospital in the negotiation of a management agreement for services rendered in the emergency department of a large public hospital system. Representation of investors and operators in the formation of 5.01(a)-type nonprofit health organizations. Representation of a Dallas-based physician group in negotiations with a Texas hospital district to outsource the provision of emergency medical services for county hospitals and provide graduate medical education programs for medical residents and fellows. Representation of a managed care company that markets and administers health insurance in various internal investigations regarding regulatory compliance. Representation of a primary care provider in the restructuring of an urgent care clinic acquisition. Representation of primary care clinics in an investigation initiated by a Medicaid managed care entity. Provision of routine operations counsel for the North Texas division of a national hospital system. Provision of HIPAA compliance advice and training for hospitals, clinics, electronic patient population management companies and other business associates. Provision of counsel and assistance with an application for payment under the Texas Uncompensated Care Program. Chambers USA , "Up and Coming" Lawyer for Healthcare (Texas) 2015; Healthcare (Texas) 2016–2018. "Up and Coming" Lawyer for Healthcare (Texas) 2015; Healthcare (Texas) 2016–2018.